The Building High Performance Teams (BHPT) programme focuses on helping individuals and teams change their thinking and how they approach fulfilment of their roles within the business. The programme uses a methodology developed by Patrick Lencioni, a leading expert in the field of leadership, management and team development. It is delivered through a series of interactive workshops where we work with the directors, managers, deputies in an organisation on a real-Iife situation based on an understanding of the areas they have ownership of, as a team, within the business. 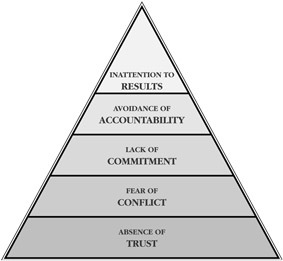 The basic focus being to help the team and its individual members make better decisions more quickly. The approach to developing individuals and teams through this programme is based on our knowledge of behavioural profiling and how it can be used effectively to help managers and team members understand one another’s different preferences, skills and attitudes and identify collective strengths and blind spots within the team. Most companies and managers instantly recognise the inherent power of teams yet despite this acknowledgment; effective team work is elusive in most companies. The main reason being that teams are made up of imperfect human beings and they are inherently dysfunctional. To overcome this problem it is important to master a set of behaviours that are uncomplicated but often difficult to implement. We typically undertake a two day workshop to help management teams break down barriers and provide a practical, hands-on approach where we focus on clearly defined processes that work on the 5 key functions (or dysfunctions as we often refer to them) necessary for achieving truly effective teamwork. These five (dys)functions are represented in the model above.